(2588 is the minimum altitude of the DEM, 7533 the maximum altitude). The result is a new raster map with zones land (1), snow (2) and mixed land-snow pixels (12). This works fine in separate steps and manually preparing the reclass rules text file. However I have thousands of files to process! How would it be possible to use the output of the table mean values to automatically populate a reclass rules text file, that can then be directly used in r.reclass? 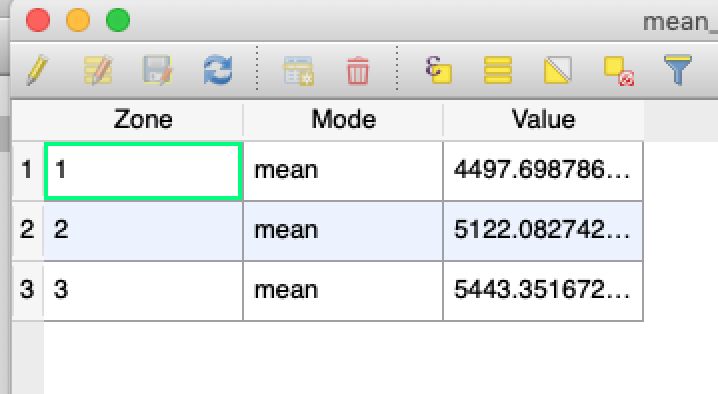 r.reclass doesn't have an option to import values from an outside table file. I guess I need to write a script for this. I have no experience with scripts so far. It opens a new window where you can add every raster one by one but it's still a tedious task for thousands of rasters. Maybe not the best code but this is my humble beginner attempt with a (for me) serious script. In the graphic modeler of QGIS I managed to implement this script and use it for multiple files in batch processing. I would like to thank everyone that tried to help with this post! I would do this by writing simple field formulae in Excel. You can then copy and paste for your new tables and do it in such a way that the table or a number of columns within it can be exported as text using space delimiters. Alternatively, wrap that into a Python function for greater automation. Not the answer you're looking for? Browse other questions tagged pyqgis qgis-2 qgis-modeler or ask your own question. Reclassifying by layer in QGIS? Refreshing values in attribute table automatically when geometry changes? Programatically populate field_4 after choosing values from other fields?